Bradly Cooper, Hollywood heartthrob known for Silver Linings Playbook, American Sniper and American Hustle, demonstrated not only his talent but also his ability for immense depth in the new movie A Star is Born. Starring himself and Lady Gaga, first-time actress, Cooper wrote and directed this monumental romance that brought a fresh and modern light to an antiquated story. Upon watching the trailer, many people, myself among them, assumed that the movie would be a stereotypical star-packed romance that carried minimal depth with maximum entertainment value; while this movie was incredibly entertaining, it carried an emotional depth that was unexpected but gladly received. Cooper managed to adapt William A. Wellman’s original 1937 screenplay into a simple yet emotionally-driven film that dared to be authentically real. The movie revolves around a star singer named Jack, played by Cooper, that meets the soul-filled singer Ally, played by Lady Gaga. As in all romance movies, they fall in love; yet, they are amidst a relational tension as Ally rises in fame and Jack begins to fall into irrelevancy. A tale told many times, this movie chooses to air on the side of simplicity in the script as well as the cinematography. The important psychological battles that each character deals with are not always directly told; rather, they are implied through the cinematography or the actor’s emotions. This, alongside Cooper and Gaga’s undeniable chemistry, creates a very realistic and authentic tone, giving room for the emotional nuance that comes with life. There are notably many distinct parallels throughout the cinematography as well, creating a story through the lens of the camera. Cooper proves throughout this movie that he understands how to tell a story through performance as well as visuals, demonstrating his potential as an actor and as a creator. Through this movie, Lady Gaga lives out her initial dream of becoming an actress. Though this is her first acting performance, she proves herself to be an actor of authenticity and depth, executing her role with a brilliant nuance. In many ways, A Star is Born mirrors Gaga’s own journey into musical stardom, leaving her the capacity to empathize with her character genuinely. She was the perfect choice for the role as this movie allowed her to exhibited her abilities as a songwriter alongside showing the depth of her talent as an actor. The heart of the film truly lies in the music. 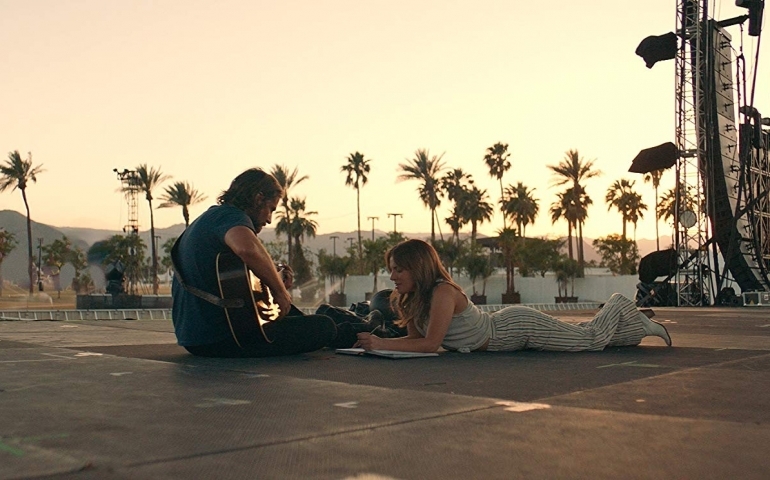 Composed by Gaga and Cooper, the music is the mode of storytelling in this movie, adding lyrical depth to the simplistic plot. Each song written fits naturally and holistically within the story, seemingly completing the narrative. Never feeling overused or exploited, the music slowly and quietly becomes the soul of the film, allowing the audience to feel this movie in every sense but the literal. Overall, Cooper managed to use simplicity to create a humble and authentic film through the acting, cinematography, and score. This film takes the average romance and, rather than forcing unneeded intricacy into the narrative, chooses the bare necessities to interpret the lives of the relationship of two stars. The emotional depth and complexity breathed into this narrative will grab the heartstrings of its viewers. Beware: tissues will be required.